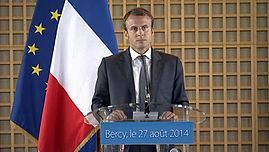 Emmanuel Jean-Michel Frédéric Macron (French: [emanɥɛl ʒɑ̃ miʃɛl fʁedeʁik makʁɔ̃]; born 21 December 1977) is a French politician serving as President of the French Republic and ex officio Co-Prince of Andorra since 2017. He previously was Minister of the Economy, Industry and Digital Affairs from 2014 to 2016. ^ "With 2,300-word letter, Macron launches debate to quell 'yellow vest' unrest". Reuters. January 13, 2019. ^ Lichfield, John (February 5, 2019). "Call Emmanuel Macron any name you like — but not 'liberal'". Politico. Retrieved February 7, 2019. One visit to Algeria, Argentina, Armenia, Australia, Burkina Faso, Canada, Chad, China, Côte d'Ivoire, Cyprus, Czech Republic, Denmark, Djibouti, Egypt, Estonia, Ethiopia, Finland, Ghana, Greece, India, Kenya, Mauritania, Netherlands, Niger, Nigeria, Portugal, Qatar, Romania, Saudi Arabia, Senegal, Slovakia, Spain, Sweden, Tunisia, Turkey, United Arab Emirates, United Kingdom and Vatican City. Two visits to Austria, Bulgaria, Luxembourg, Mali, Morocco and Switzerland. Three visits to Italy, Russia and United States. This is a list of presidential trips made by Emmanuel Macron as the 25th President of France. Benjamin-Blaise Griveaux is a French politician who was elected to the French National Assembly on 18 June 2017, representing the department of Paris. He is a spokesperson for the En Marche! movement and has frequently been described as one of Emmanuel Macron’s closest political allies. 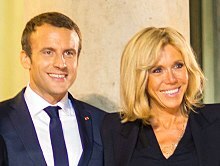 The Benalla affair or Benalla affairs are political and judicial cases involving Alexandre Benalla, who served as a security officer and deputy chief of staff to French President Emmanuel Macron. Cédric O is a French politician, currently serving as State Secretary for the Digital Economy of France.